The patient is a 17 y.o. female referred to our office by her orthodontist for evaluation and treatment of her dentoskeletal malocclusion. Medical history revealed a well developed white 17 y.o. female, with no allergies or past operations. 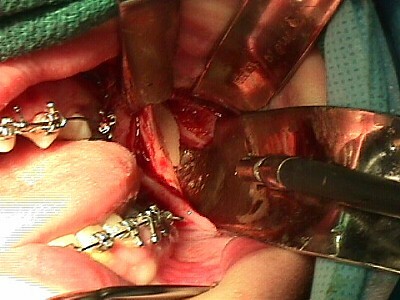 Oral-Facial examination revealed maxillary and mandibular orthodontic appliances. A hypoplastic maxilla was noted with congenitally missing teeth #'s 1, 4, 5, 12, 13, 16, 17, and 32. Peg lateral incisors were noted with a maxillary diastema. Teeth #'s 2 and 15 had not completed eruption. A Class III canine and molar relationship was present bilaterally. Flat nasolabial folds and infranasal region were associated with a concave facial profile. 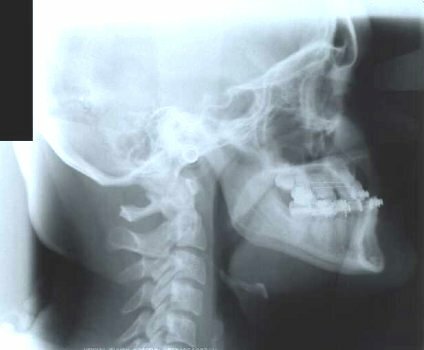 After To enlarge, click on the cephalometric x-ray. Patient still in active treatment. To enlarge, click on the panoramic x-ray.